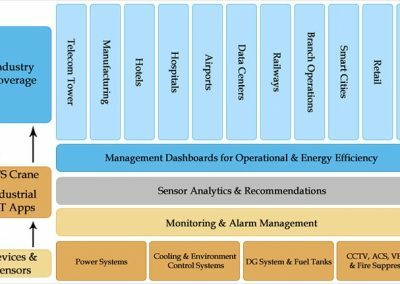 GFS Crane® is an Industrial IoT portfolio for Smart Infrastructure Management – powered by IoT, Sensor Analytics & Business Intelligence for capital intensive sites. 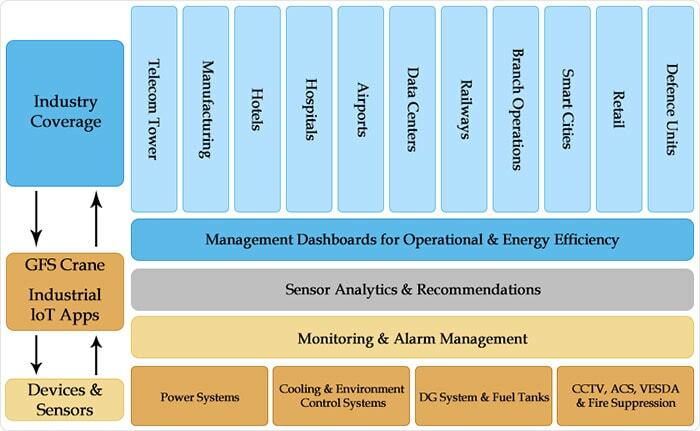 Each application comes with advanced monitoring, analytics and management capabilities for mission critical facilities like Data Centers. GFS Crane can be hosted in a Private/Public Cloud. This enables central remote monitoring, control & management of geographically distributed devices in Bank Branches & ATMs,Telecom Facilities and Smart Cities. Industrial IoT is reshaping manufacturing, mining, logistics and every other industry on this planet. GFS Crane Industry IoT Application Portfolio is built to support a wide industry landscape through multi-protocol support, flexible layered reports architecture and ease of customization.